The 1985 German Grand Prix is the last GP in which three cars of the same team were entered. Hesnault's No.14 Renault wasn't eligible for points, however, and was solely entered for on-car camera development in a race situation. In the end, there wasn't much developing to do, journeyman Hesnault retiring on lap 8. It was the Frenchman's last GP appearance after spells at Ligier and Brabham. His Ligier signing came as a surprise, as François had no true results to show for in European F3. The jump to a turbo-powered F1 car must have posed a steep learning curve for Hesnault but he acquitted himself well against Andrea De Cesaris. But with the French team still rebuilding after a disastrous 1983 season, he had no real results to show for. There was hope results would be coming when he signed to drive the second Brabham in 1984, but in his four acquaintances with a top-line team he was totally outpaced by his Champion team mate. 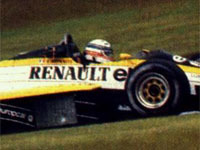 Thus it came as no surprise that his non-qualification at Monaco led to his replacement by Marc Surer. After his Renault one-off in Germany Hesnault disappeared from the international motor racing scene altogether.